This being Cyber-Monday, we focus on a few more tech products than normal, understanding that today’s shooters also need advanced chronographs, battery packs, laser rangefinders, and other digital gadgets. Please note that many of the Black Friday deals we featured are still in effect through 11:59 pm Monday 11/26/2016. CLICK HERE for Black Friday FEATURE. If you’ve been wanting to get a LabRadar Chronograph, here’s your chance. Now through Dec. 9th you can save $60 on this very advanced piece of technology — probably the most sophisticated chronograph system ever offered to the general public. That’s notable because you almost never see this discounted below the $559.95 MAP price. Recent updates also now allow you to operate your LabRadar with your mobile device making it that much more amazing. 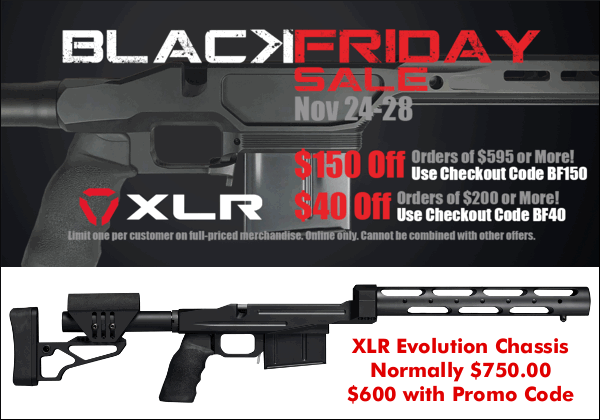 You can take advantage of this deal and grab one for $499.95 or $499.99 at Brownells (Code VB5 for FREE Shipping), Bruno’s Shooters Supply, Creedmoor Sports, or Midsouth Shooters, or MyLabRadar.com. Sportsman’s Guide is running a huge CYBER MONDAY SALE on hundreds of items. You’ll find them on the SALE PAGE grouped by discount — 30%, 40%, and 50%. We found scopes, gun cases, hunting gear, tools, and lots more. You should definitely check this out. Some incredible deals. Also, for other items, you can get double Buyers Club discount with CODE SH2625. 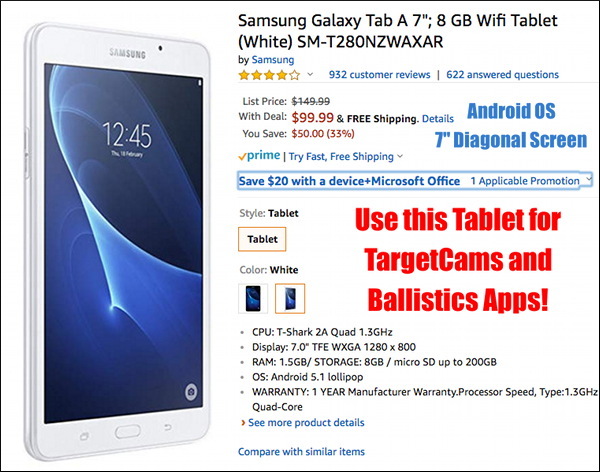 Versatile and totable, this compact Samsung Galaxy 7″ tablet computer is just what you need at the range to run your Ballistics Apps, get WiFi images from your target Cam, or “talk” to your LabRadar. The Galaxy Tab A 7.0 inch can also get internet weather reports and email. Heck you can even use it to post on our AccurateShooter’s Forum. This is a modern device with myriad capabilities — all for under $100.00. You won’t find more bang for the buck in a digital device. NOTE: This is WiFi only — it is NOT a like a cellphone. It works via an internet connection (and blue-tooth). If you need a good scope at a great price, now’s a great time to buy. 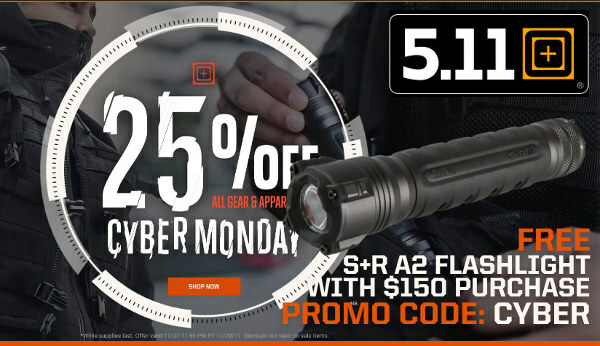 This week Graf’s is running a Sightron Holiday sale with 25% off most Sightron scopes. For example, the Sightron SIII 10-50x60mm FCH scope is marked down from $1089.99 to just $817.49. That’s a killer deal on a scope that is good enough to win major matches. Many other products are on sale at Graf’s this week. 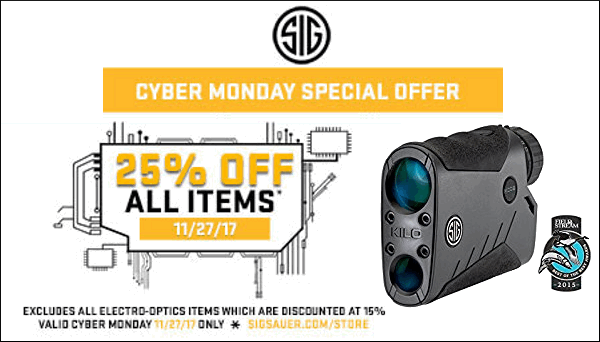 Save 20% or more today on Sig Sauer Electro-Optical products. These include red dot sights, and conventional Sig “Tango” and “Whiskey” zoom scopes that have illumination or other electro-optical features. For example, the illuminated Tango4 6-24x50mm is marked down from $1099.99 to $869.00, a $230.99 savings. SIG SALE HERE. Need a high-quality hunting, tactical, or target-shooting stock. Save 15% TODAY ONLY on McMillan and McCubed (MC3) stocks purchased online. This deal is ONE-DAY only, expiring at 11:59 PM MST on November 26, 2018. 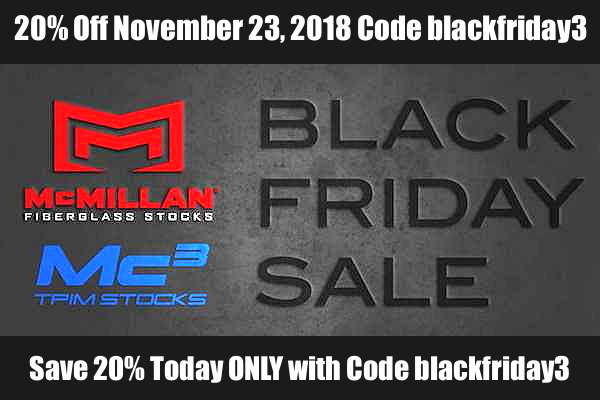 Here’s your chance to save $100 or more on a premium McMillan or MC3 stock. NOTE: To save 15% use CODE cybersale3 during check-out. SHOP McMillan HERE | SHOP McCubed HERE. Everything you see above can be yours for just $269.99. Great Deal. 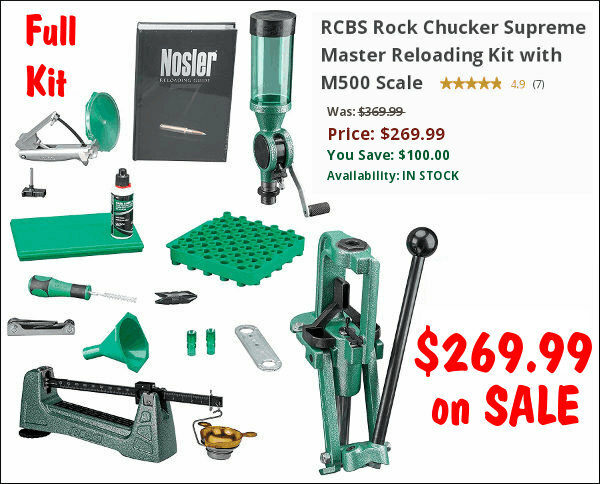 Right now, Natchez is selling the Rock Chucker Supreme Master Reloading Kit for $269.99, a great price considering all the hardware you get: Press, Primer Tool, Scale, Powder Measure, Loading Tray, Reloading Manual and more. Heck, the Rock Chucker press alone is worth $160.00+. 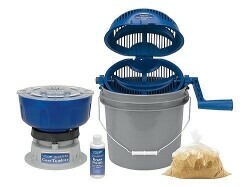 This is good starter kit for any reloader with sturdy items (like the Rock Chucker press), that will last a lifetime. The Hornady Lock N Load Auto Charge Electronic Scale/Dispenser is now on sale for just $147.99 at Midsouth Shooters Supply, discounted way down from the regular $228.98 price. That’s the lowest price we’ve seen on this product in a long time, making this a real bargain. If you are looking for an affordable combination digital scale and powder dispenser, this is very attractive pricing. By comparison, the new RCBS ChargeMaster Lite sells for around $250.00 and is back-ordered at most vendors. That means you can save at least $90.00 by buying RED instead of GREEN. Here’s a stunning deal if you’re looking to build a budget varmint or hunting rifle. With MidwayUSA’s Cyber-Monday pricing, you can get a quality Sig Sauer 3-9x40mm scope for just $109.99 — less than some guys will pay just for a set of rings. This waterproof Sig scope features LD glass and 1/4-MOA clicks. It comes with full Sig Sauer warranty, so you can purchase with confidence. 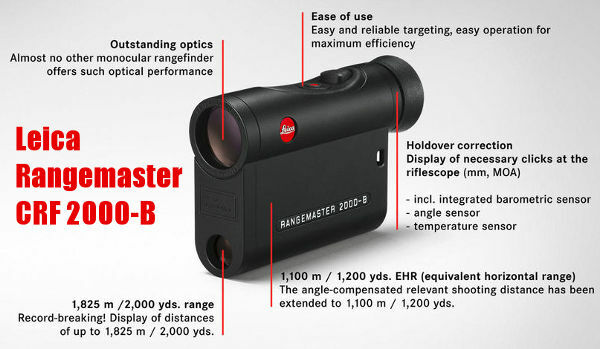 This may be the best deal we’ve seen on the vaunted Leica 2000-B Laser Rangefinder (LRF) with 7-power optic. This unit is rated out to 2000 yards on reflective objects. The Leica 2000-B features air pressure and temperature sensors, plus on-board inclinometer. Angle correction works out to 1200 horizontal yards equivalent, with the true hold-over displayed in both MILs and MOA. The compact Leica CRF 2000-B weighs just 6.5 ounces and measures 4.5″ L x 2.25″ H x 1.25″ W. It has a waterproof outer shell. 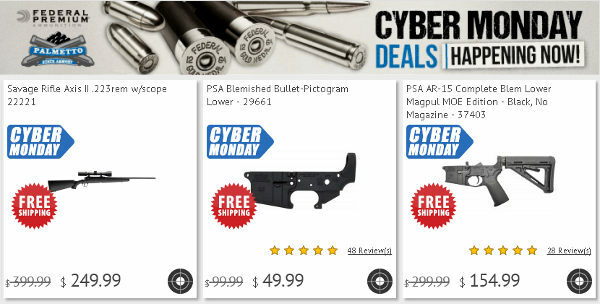 Share the post "Bargain Finder 166: AccurateShooter’s Cyber Monday Edition"
Today is Black Friday, the biggest SALE day of the year. We’ve scoured the internet to find killer deals from 12 vendors. You’ll find super deals on firearms, along with reloading tools, shooting accessories, and even gun safes. Check out these deals. Some of these special offers are for Friday only, November 23, 2018. Other promotions extend all weekend, all the way through Cyber-Monday, November 26, 2018. If you hand-load, you know Lapua is top tier stuff — great brass, great bullets, superior loaded ammo. 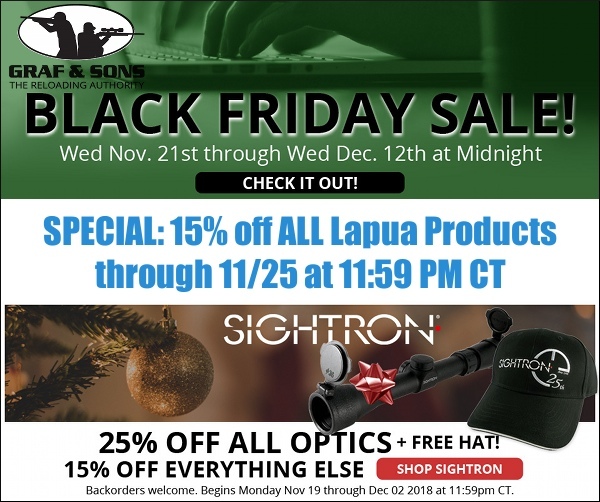 As a Black Friday through Sunday special, Grafs.com is offering 15% off ALL Lapua products. 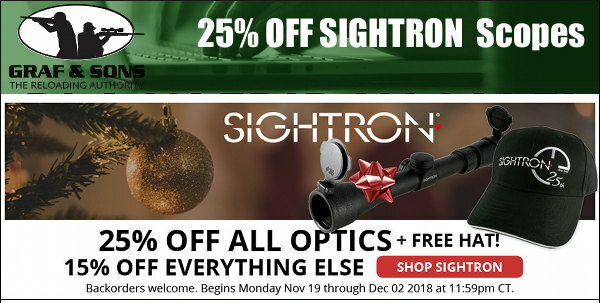 In addition, Graf’s has some great deals on optics, running a Sightron Holiday sale with 25% off most Sightron scopes. Many other products are on sale at Graf’s this weekend. 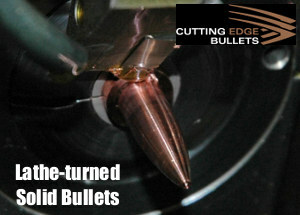 21st Century makes some of the most sophisticated reloading tools on the planet. Our editors use 21st Century case lathes, concentricity gauges, and Hydro bullet seaters. 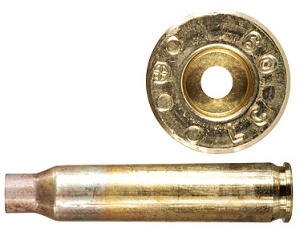 These great tools will help you load better ammo, with more consistency, in less time. And now you can save money too. 21st Century Shooting will be offering 15% Off with FREE Domestic shipping Friday 11/23/18 through Monday 11/26/18 at 11:59 PM. To get the 15% savings use Coupon Code W9es52. For Domestic orders be sure to choose “FREE SHIPPING” at checkout. 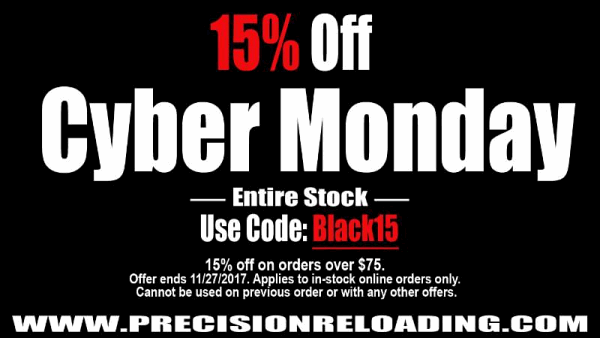 Precision Reloading is running a compelling Black Friday promotion through Sunday 11/25/2017 at 11:59 PM. Here’s the deal — starting today you can save 15% off all orders of $100.00 or more. That means effectively that everything Precision Reloading sells is 15% off (as long as you spend at least $75.00). Yes that includes powder, bullets, dies, reloading tools and more. Get your 15% savings by using CODE “PR18BLK” during check-out. McMillan and McCubed Stocks — Save 20% Today ONLY! You can now get big savings on high-quality McMillan and McCubed (MC3) rifle stocks. Today, Black Friday, McMillan and McCubed are offering 20% OFF stocks purchased from the online stores. This Black Friday Special also includes FREE Shipping within the continental United States. Use promo code blackfriday3 at check out. NOTE: This is a ONE-Day sale ONLY! The sale ends today, November 23, 2018 at 11:59 PM. Credit EdLongRange for finding this sale. 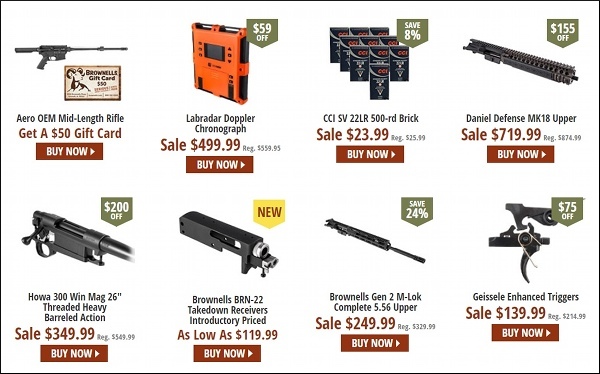 There are some killer Brownells discount codes now through 11/25/18 (Sunday) at 11:59 pm. These all use the FN prefix. Get Free Shipping with no minimum with Code FN4. Get $20 off $200 with Free S/H with code FN3. Get 10% Off $300 with Free S/H with code FN2. 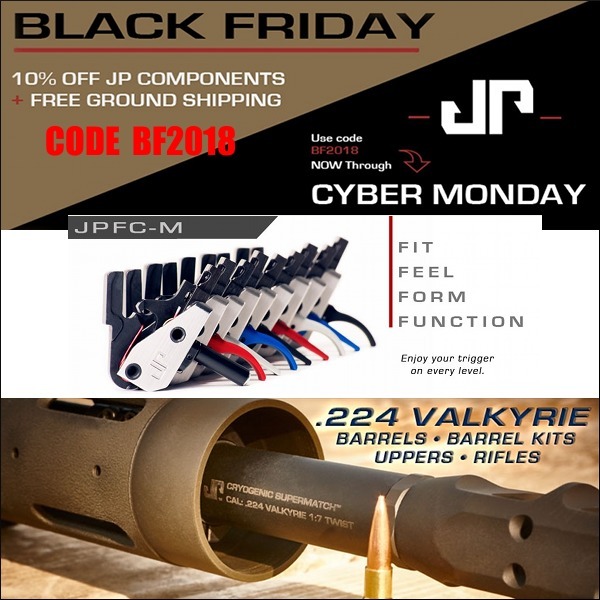 Along with this savings codes, Brownells has discounted many popular products for the Black Friday Cyber Monday weekend. For example, you can get the LabRadar Chrono for $499.99 ($60 Off), Howa 300 WM Barreled Action (with trigger) for $349.99, and Geissele Enhanced AR Trigger for $139.99 ($75 Off). There are also great savings on Nikon optics. Plus when you buy a complete firearm, you can get a Brownells gift card worth up to $100.00. 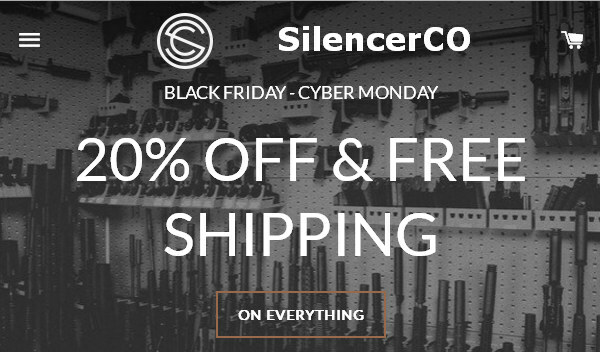 BulletCentral.com is running an attractive sale all Thanksgiving weekend, starting 11/22/2018 and running through 11/26/2018. Save on Sierra bullets, SK rimfire ammo, Lapua 6mm Creedmoor brass, ThoroughClean cleaning products. And you can also get FREE Shipping on Bix ‘N Andy triggers, and Kelbly Actions. CLICK HERE for Sale items. 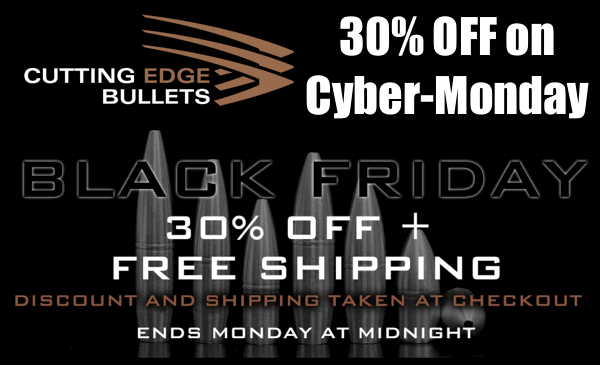 Midsouth Shooters Supply is running a big sale and Prize Give-Away for the full Black Friday through Cyber-Monday period. CLICK HERE to see SALE Items, discounted up to 50%. And are you feeling lucky? Midsouth will give away 12 Hornady Lock-N-Load Reloading Tools and Presses the day after Cyber Monday. Prizes include Lock-N-Load Progressive Press, Lock-N-Load Iron Frame press, Auto-Charge Powder Dispenser, and more. Come back every day for another chance to enter. In addition to these savings Natchez has some great deals right now on Leupold scopes plus rebates on Federal Black Pack ammunition. Credit EdLongRange for finding these promo codes and discounts. 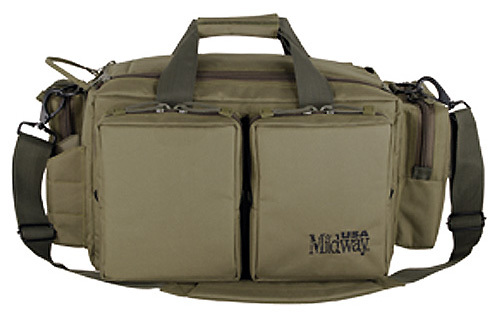 MidwayUSA is running an extended Black Friday/Cyber Monday sale. Dozens of items are deeply discounted, PLUS you get FREE Shipping on all $49+ orders with Code CyperFS49. Look for bargains on optics, accessories, reloading tools, hunting gear, and ammunition. 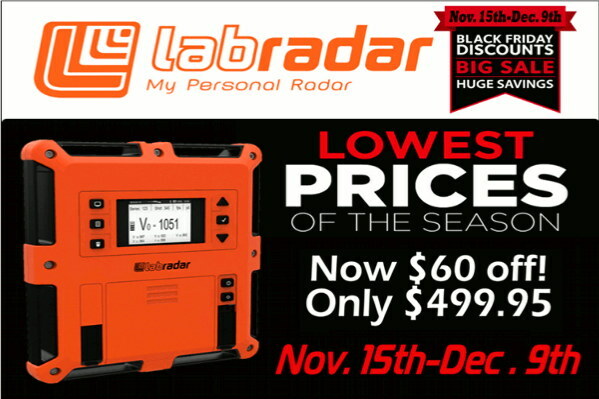 Hundreds of items are on sale, including LabRadar Chronographs, TargetVision Target Cams, Vortex Scopes, Hornady Reloading Presses, Athlon Spotters and much more. SEE Sale Items HERE. Black Rifles on Black Friday? You bet! Davidson Defense has you covered. Now through Monday, November 26, 2018, save on many products in Davidson Defense’s online store: complete uppers, stocks, buffers, handguards, trigger groups, muzzle brakes, parts kits and more — pretty much everything you need to build an AR but the lower. If you love tacticool products, you’ll like the Davidson’s store, and now is a great time to buy. 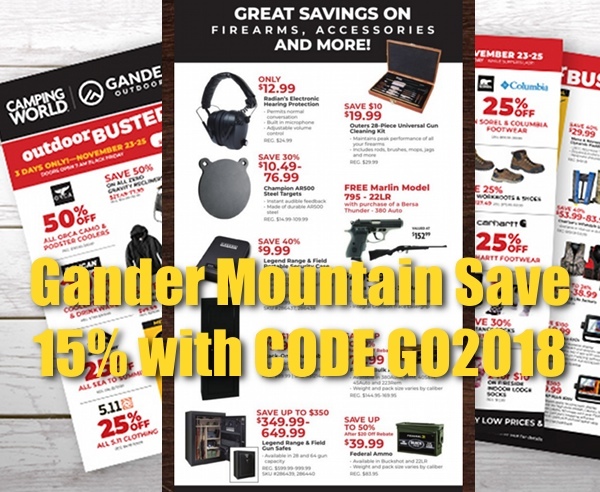 While Gander Mountain is a general-market outdoor sports store, not a hunting/firearms-focused retailer, Gander still offers a wide selection of products for shooters. This weekend you can get big savings on a host of products. You can save 15% on rifles, pistols, ammo, gun safes, and more. To qualify for 15% Off your order (no minimum) with FREE shipping, use Code GO2018. 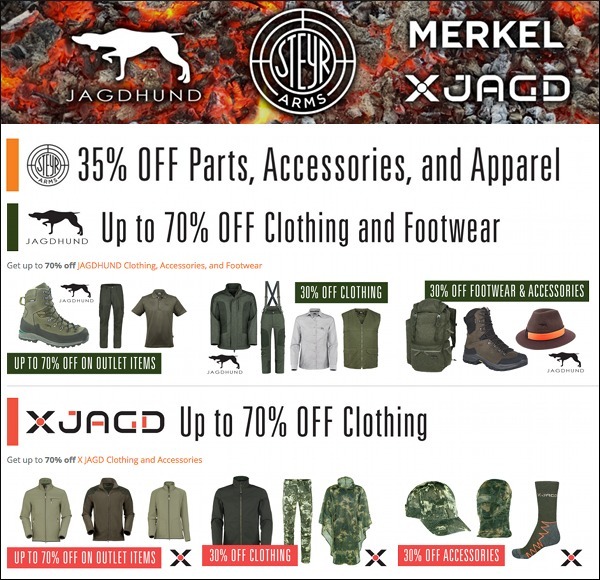 CLICK HERE for Gander’s Sale Items. SWFA, a Texas-based retailer, is offering 15%-20% discounts off major product lines, including Vortex, Burris, EoTech, Leupold, Harris Bipods, and more. In addition, prices on SWFA’s “house-brand” SS scopes have been slashed up to 50%, so you can save $100 or more. CLICK HERE for all SWFA Black Friday Sale items. Credit EdLongRange for finding the TFB Black Friday Sale Page. 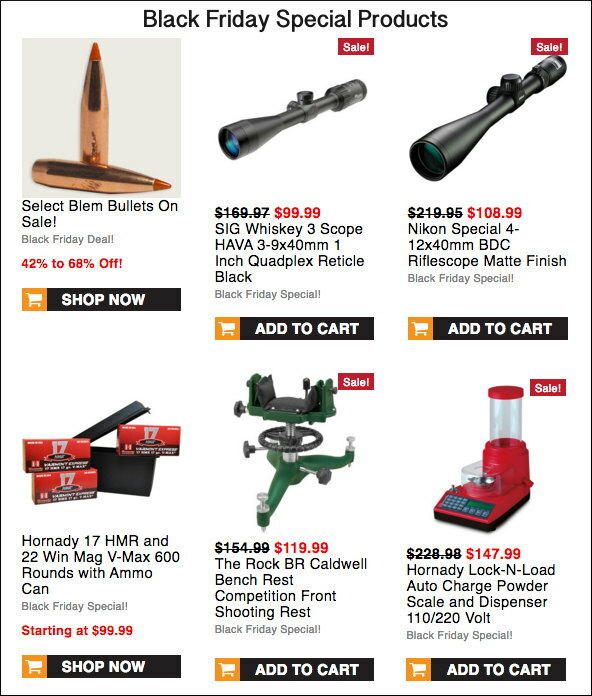 Share the post "Black Friday Super Sales — Huge Savings on Popular Products"
This may be the mother of all Black Friday sales — at least for optics and some premium rifle brands. EuroOptic.com is running a MASSIVE discount/blow-out/liquidation sale all weekend. Save on premium optics makers: Nightforce, Zeiss, Vortex, Leica, Elcan, EoTech, Minox, Minolta and more. 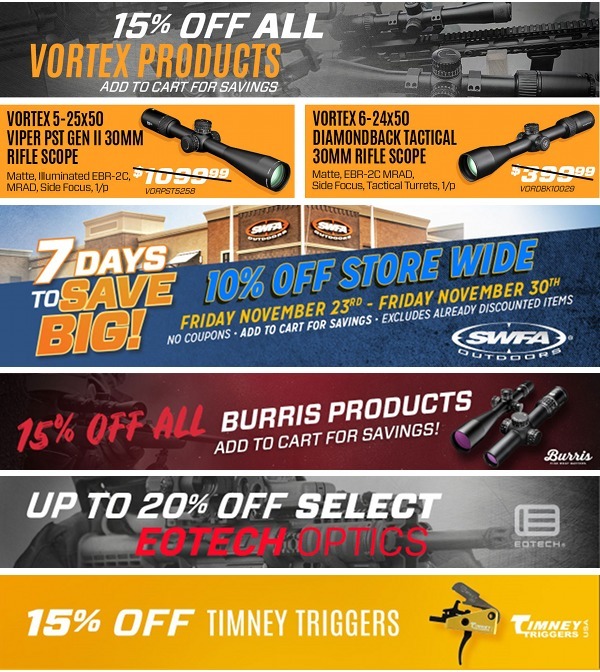 For example, save 16% on Vortex Optics. Save 10% or more on Leica products (including LRFs and binoculars). And there are also great deals on rifles from Sako, Tikka, Barrett, FN, Christensen Arms, Ritter & Stark, and more. 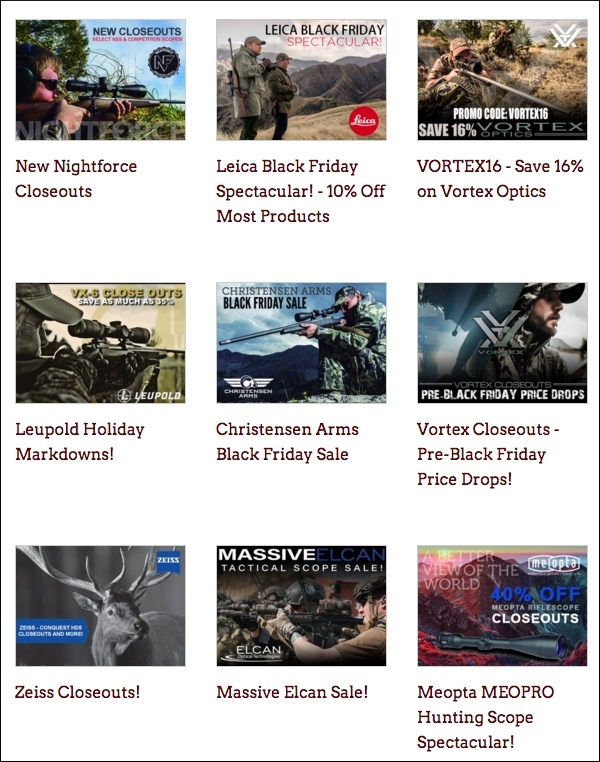 Here’s a screenshot of just half of EuroOptic’s Black Friday Sale Page. You get the idea — there’s a TON of great stuff on sale at really attractive prices. It’s time to get the credit cards out boys and girls! 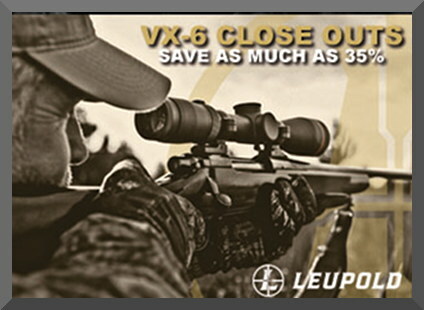 Leupold VX-6 Super Close-Out Sale. Grab these Leupolds before they’re gone! 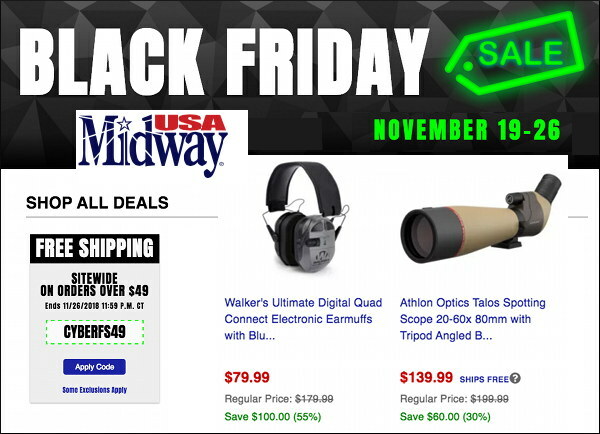 Share the post "Great Black Friday Deals on Big Name Optics (and Rifles Too)"
Quite a few outdoor gear and shooting sports vendors are offering FREE SHIPPING for the next few days during the Thanksgiving/Black Friday/Cyber-Monday sellathon. You could easily save $20 or more on shipping fees with these promotions. Be aware that hazmat fees will still be imposed and some items may not qualify for free shipping. For example, Cabela’s free shipping does not include firearms. 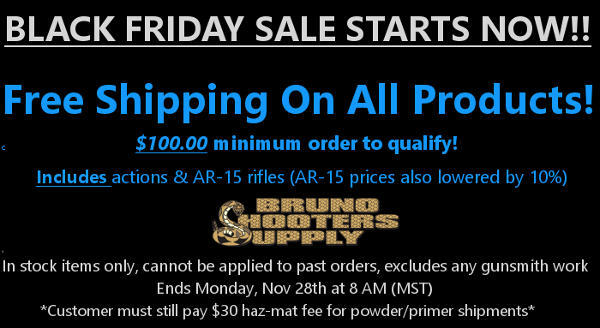 Bruno Shooters Supply is offering FREE Shipping on all products, with a $100.00 minimum order. This special includes actions and AR-platform rifles. NOTE: $30 Hazmat fee still applies to powder and primer orders. This FREE Shipping special is good through 11/28/2016 at 8:00 am MST. 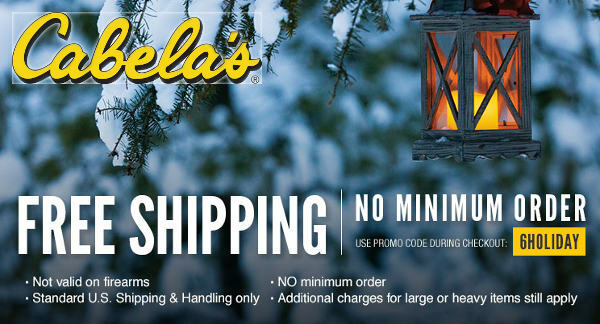 Cabelas.com is now offering FREE Shipping on all orders with no minimums. That’s right — get any order shipped at no charge. Use Code 6HOLIDAY during checkout. NOTE: This applies to ammunition, but not firearms. Hazmat and oversize charges may still apply. Offer expires 11/29/16, 11:59 pm EDT. Sportsman’s Guide is offering FREE domestic Shipping on all merchandise other than firearms and trolling motors. Use Coupon Code SH1252 at Checkout. NOTE: Heavy/bulky charges and Gun charges (Pistol $10 and Long Gun $5) still apply. Alaska and Hawaii charges still apply. Offer expires 12/1/2016 at 11:59 pm CT.
NRAStore.com is offering free super-saver shipping on all orders over $80 with promo code FRIDAY16. Included in your order will be a Stand & Fight hat. 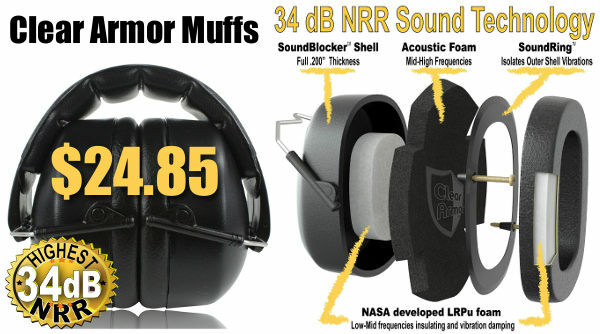 The NRA Store offers a wide variety of products: sportswear, shooting gear, range bags, holsters and much more. This offer runs through Sunday, December 4, 2016. 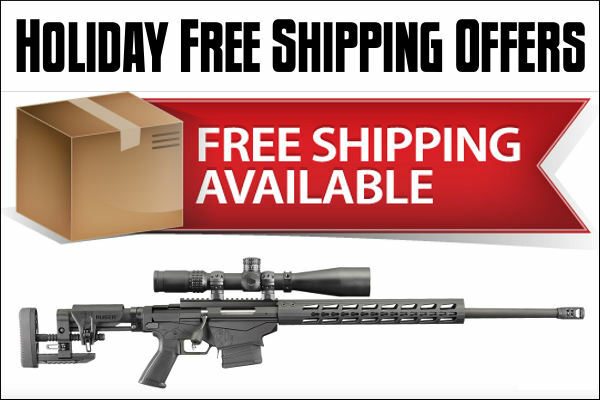 Share the post "Holiday FREE Shipping Offers at Major Vendors"
Palmetto Armory is running some spectacular deals today. Pick up a complete AR platform lower for just $154.99. Or get a Savage Axis .223 Rem Rifle (with scope) for just $249.99 (shipping included). These Cyber Monday Deals expire at Midnight on 11/30/2015, don’t don’t hesitate. 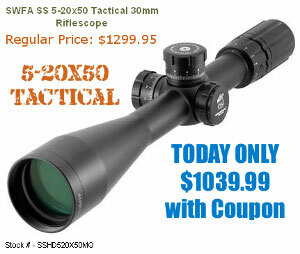 This is a very good deal on a quality 6.5-20X scope. Read the Amazon reviews — guys are comparing this scope to Leupolds that cost hundreds more. Reviewer Nomad says: “Unbelievably good scope for the money. This is one of the best, if not THE best, scopes you’ll find in this price range.” This particular 6.5-20x50mm PA Model features side-focus parallax and a Bullet Drop Compensating reticle. Want to get your brass clean inside and out? This wet tumbling kit contains everything you need — even a big magnet to grab the stainless pins. The $199.99 tumbling bundle includes Platinum Series Rotary Tumbler, 10 pounds of Stainlesss Steel Media, and a Media Release Magnet. This kit will be offered by Midsouth Shooters Supply for a limited time only. If you’ve been patiently waiting to acquire a Forster Co-Ax® reloading press, now’s the time to strike. 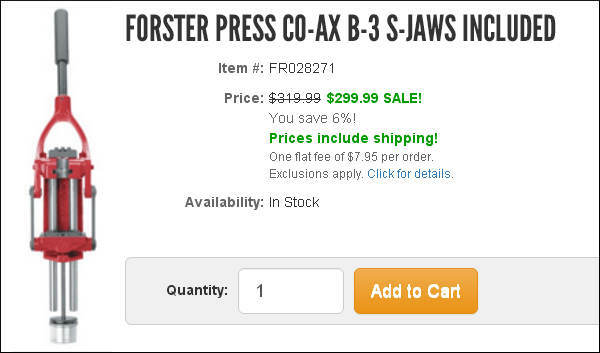 Grafs.com has Co-Ax presses on sale this week at $299.99. That includes shipping charges (with one flat $7.95 handling charge per order). Purchase any Leupold VX-3 riflescope from November 15th, 2015 to December 31st, 2015 and you can get a rebate in the form of a $100.00 check. Now through 12/31/2015 you can get $100.00 back on any Leupold VX-3 Riflescope. The rebate applies to the entire VX-3 line. After purchase you can apply for the rebate online or by mailing in the Leupold VX-3 Rebate Form. For more info, visit www.Leupold.com/rewards. There’s still time to save big bucks at Brownells.com. Hundreds of items are on sale, plus you can take 10% off your entire order (of $150 or more) with Coupon Code L3X. Just use CODE L3X during check-out through 11:59 pm on November 30, 2015. Now through 12/5/2015, Cabelas.com is offering a wide selection of Cyber Week Deals. You’ll find deep discounts. Show above are some of the Cyber Week Specials. That’s a great price on the Garmin unit and the $9.99 gear bag is a steal. Share the post "Bargain Finder 11: AccurateShooter’s Deals of the Week"
Lake City NEW 5.56×45 Brass (500 cases): $59.99 marked down from $114.99. 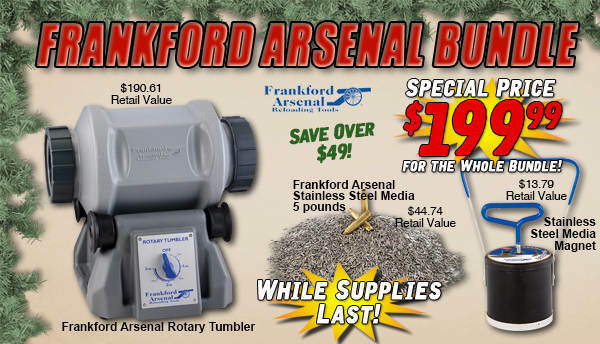 Frankford Arsenal Quick-N-EZ Case Tumbler Master Kit: $53.99 marked down from $73.99. Frankford Arsenal Stainless 6″ Electronic Caliper: $10.99 marked down from $22.99. 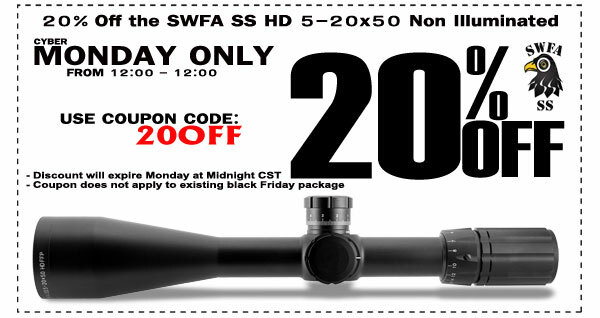 Share the post "MidwayUSA’s “Second Chance” Cyber Monday Sale Today"
As a Cyber Monday Special, SWFA.com is offering 20% off its popular SS 5-20x50mm Tactical riflescope. This is a First Focal Plane (FFP) scope with 30mm body and side parallax focus. The turret clicks (Elevation & Windage) are 0.1 Mrad to match the illuminated mil-based reticle. Turrets have 10 Mils per revolution, with 30 Mils (100+ MOA) of total elevation travel. Regular price for this scope is $1299.95. TODAY ONLY, November 28 (until midnight CST), the scope is 20% off with Coupon Code “20Off”. That cuts the cost to $1039.99 — a great price on a full-featured illuminated FFP tactical scope. Discount tip from EdLongrange. We welcome reader submissions. Share the post "Save 20% on 5-20x50mm FFP Tactical Scope Today ONLY"
Looking for bargains on firearms, hunting gear, and reloading equipment? You’ll find scores of great deals in the next few days, as major online vendors roll out their Thanksgiving, Black Friday, and Cyber-Monday discount programs. While many folks may look to save a few bucks on bullets or ammo, think about shopping for big-ticket items as well. 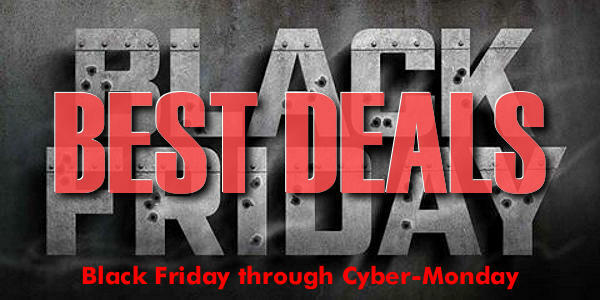 There are some great Black Friday deals on gun safes and complete rifles. Some sales are on Friday, Nov. 25 only. Other items on sale Nov. 24 – 27. Check the website for additional deals. More items are added everyday. FREE Shipping on orders over $99.00. Chose “SPC” shipping Code at Check-Out. Offer Expires 11:59 pm, Nov. 25. Friday, Nov. 25th Specials. Note: deals may not be available at all stores. These are just a small sample of the items that are on sale. Some items are on sale Thursday or Friday only. Others product may be on sale for 3-4 days, or through November 30th. 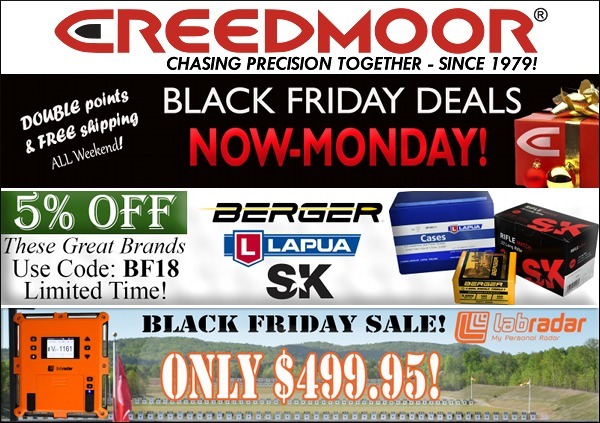 Share the post "Black Friday and Cyber Weekend Sale Links"
Looking for a great deal on a firearm, hunting gear, or reloading supplies? 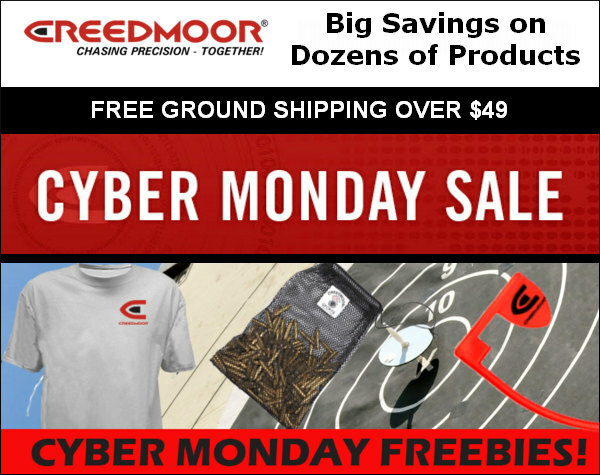 Well dozens of vendors nationwide are putting shooting sports products on sale next week, as part of the Black Friday/Cyber-Monday sellathon. But how do you find all the good deals without spending hours surfing the web? Here’s a tip: Slickguns.com has scanned multiple websites, assembling a four-page collection of bargain offers that commence on Black Friday (November 25th). 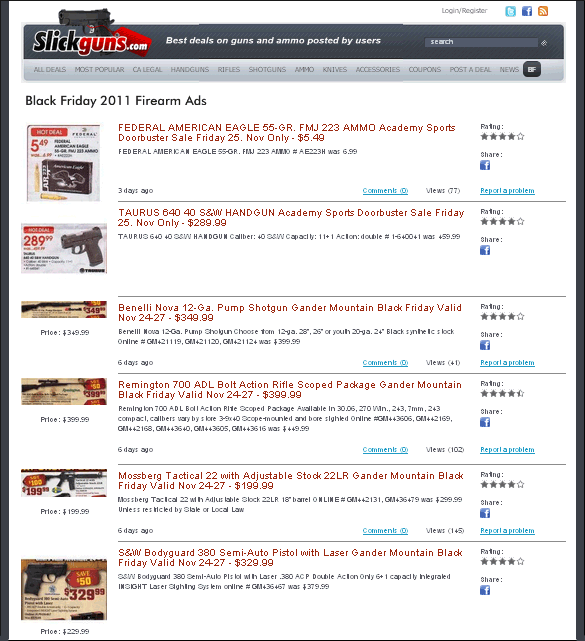 To check out scores of upcoming bargains, visit the Slickguns.com Black Friday Sale Page. Many of the sale prices are good through the end of the month. At Cabela’s, you’ll find deals on everything from rimfire ammo to Bushmaster AR15s. Gander Mountain has some great deals on firearms, including a special on scope-equipped Remington 700 ADL rifles. November 24-27, the Rem 700 ADLs are just $399.99, including a 3-9×40 scope. 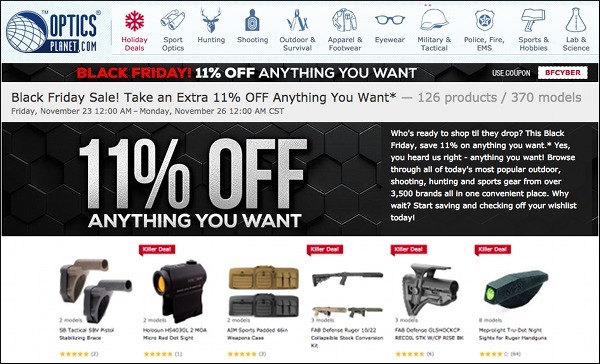 Share the post "Find Multiple Black Friday Sales All in One Place"
As an extended “Black Friday” sales promotion, Brownells is offering 10% off all orders over $150. 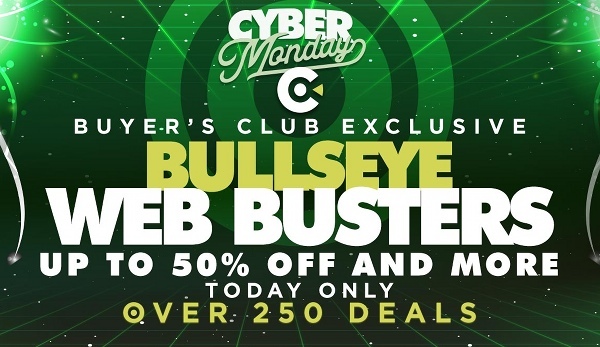 This promo, which started on November 27th, runs through midnight, on “Cyber-Monday”, November 30th. To qualify for the 10% discount, visit brownells.com and use Coupon Code CYB to get 10% off any order over $150. NOTE: There are also many specially-priced items on sale all weekend long. You can use the 10% discount (Code CYB) even on these special sale items. Sinclair International is running a similar promotion through midnight on Monday November 30th. Again you can get 10% off any purchase. However, to qualify for the discount, your total order must exceed two hundred dollars ($200.00). To get your discount (on orders over $200) use Promotion Code SAVE10 during online check-out. 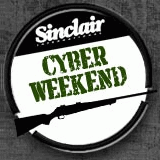 Share the post "10% Off Promo at Brownells and Sinclair Int'l Through Monday"